I am beginning to think that it's the curse of homesteading. Every homesteader (or most) does this, no matter how much we say we won't, it always happens. Starting new projects before old projects are finished. You know, when you start fixing fence, then decide that a tractor would really help, so you buy a tractor. The tractor is perfect, except that the bucket needs some adjusting. So you spend a day working on the tractor. Now the tractor can dig big holes, so you decide that the end of the driveway needs a cattle guard installed. Now what good is a cattle guard if you don't have a cow. Lets get a cow you say. Before you can bring the cow home, you have to make sure the milking stalls are finished just so. The milking stalls are almost finished, so here comes the cow. Later you realize something. You forgot to fix the fence. Now the above story is fictional, it's just something that I can see totally happening to us. Why? Because we live life like it's a contest of how much we can pile on our plates. I walked around the property today taking inventory of projects that we are currently working on. These are all projects that we have already started or have to have done pretty soon. I'm sure I'm missing some. Of course when our wood stove arrives we can add that to the list too. Why do we do this to ourselves? It just creates a sense of urgency that leaves us stressed out. Pretty soon I just might have to add "find hubby a chiropractor" to my list. I loved this post. Your fictional story was great. Brought to mind "If You Give a Mouse a Cookie". I'm really loving your blog. Our little homestead always has something that needs done. 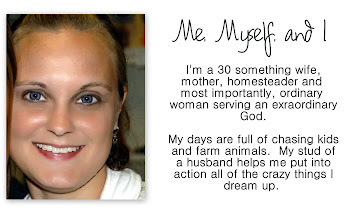 Homesteading ourselves...we had a great laugh at this post...completely relate!! I agree with Rachel E...with the exception that I was thinking of the book "If You Give a Pig a Pancake" LOL Thanks for sharing.